When potential customers are searching the web do they find your business? Or do they find your competition? Ranking is important and there are plenty of companies that claim to help. But at Superior Internet Marketing, we focus on search engine optimization specifically to impact your business. SEO is what we know, love and do. We’ve spent over a decade honing our craft because ultimately we don’t want to improve your site’s ranking; we want to improve your business. We want to help you win more prospects and convert more customers. In today’s market, effective Search Engine Optimization (SEO) can mean the difference between being highly visable online and being completely out of sight. Between static revenues and a healthly growth curve. Between success and failure. 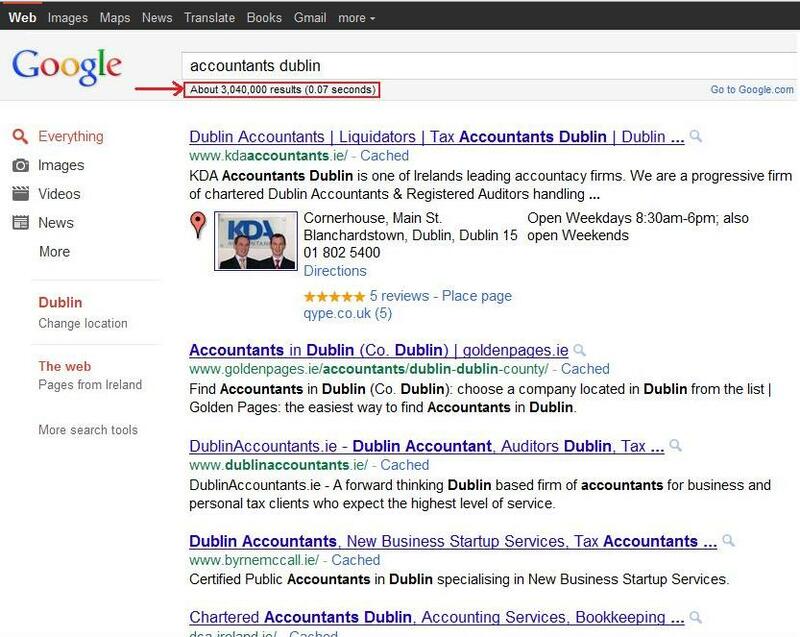 Suppose you type in “accountants dublin”, and click “search.” An instant later, you’re presented with about 3,050,000 search results. On your monitor is the first of fifty-six pages of web sites that, to one degree or another, match your search. But lets face it, there is no way you’re going to click through all fifty-six pages. You’re probably not even going to scroll down “below the fold” on the first page. You’re going to visit one of the sites listed at or near the top of page one. That’s why businesses want so badly to be at or near the top of search engine listings. How in the world did Google know just what you were after? Anyone who tells you they know exactly how it’s done is either a key employee at Google, or a liar. Search engines are extraordinarily sophisticated programs, and the best ones are changing constantly in an effort to provide web users with the most relevant search results, while avoiding being “gamed” by businesses that try to manipulate the system to achieve higher ratings. Anyone who tells you that they have found some near-magic formula or trick that outsmarts the major search engines and will guarantee you top rankings is also not a key employee at Google. That person is a liar. While there are no magic formulas to achieving high search engine results, there are tried-and-true practices that, if fully understood and implemented, will result in top rankings. “Clients who hire us for a six-month campaign see a minimum 200% increase in search engine-related traffic. At Superior Internet Marketing, we know all about those practices. We know what search engines are always looking for: web sites that are well organized; that use “clean” coding; that have content that is relevant and easily categorized; that link to related information. All these characteristics are encompassed in Search Engine Optimization. Now see how Superior Internet Marketing works. We just flat out know SEO and we deliver results. We cover SEO from soup to nuts, focusing on keywords, site optimization, content, links, online press releases, video and lots more. And what we do just works. Clients who hire us for a six-month campaign will typically see a minimum 200% increase in search engine-related traffic, with average increase even higher. It’s worked for our clients and it can work for you. Several SEO options are available, from fully customised campaign management to one-time consulting and training. Below are our standard SEO packages that we offer. We’re sure that there is something there for you and your business. Take a look at our Standard SEO Packages By Just Clicking Here Now.